High-risk breast lesions are biopsy-diagnosed lesions that carry an increased risk of developing into cancer. Because of that risk, surgical removal is often the preferred treatment option. However, many high-risk lesions do not pose an immediate threat to the patient&apos;s life and can be safely monitored with follow-up imaging, sparing patients the costs and complications associated with surgery. "There are different types of high-risk lesions," said study author and radiologist Manisha Bahl, M.D., M.P.H., from Massachusetts General Hospital (MGH) and Harvard Medical School, both in Boston. "Most institutions recommend surgical excision for high-risk lesions such as atypical ductal hyperplasia, for which the risk of upgrade to cancer is about 20 percent. For other types of high-risk lesions, the risk of upgrade varies quite a bit in the literature, and patient management, including the decision about whether to remove or survey the lesion, varies across practices." 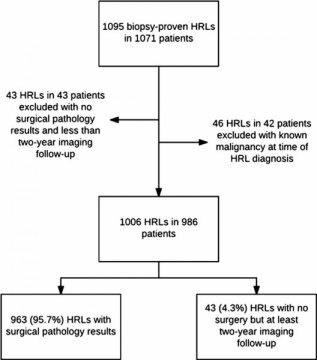 Dr. Bahl and colleagues at MGH studied the use of a machine learning tool to identify high-risk lesions that are at low risk for upgrade to cancer. The study resulted from a close collaboration between researchers at the Massachusetts Institute of Technology&apos;s (MIT) Computer Science and Artificial Intelligence Laboratory in Cambridge, Mass., and breast imaging experts at MGH. "Because diagnostic tools are inexact, there is an understandable tendency for doctors to over-screen for breast cancer," said coauthor Regina Barzilay, Ph.D., the Delta Electronics Professor of Electrical Engineering and Computer Science at MIT. "When there&apos;s this much uncertainty in data, machine learning is exactly the tool that we need to improve detection and prevent overtreatment." The machine-learning model identified the terms "severely" and "severely atypical" in the text of the pathology reports as associated with a greater risk of upgrade to cancer. "Our study provides &apos;proof of concept&apos; that machine learning can not only decrease unnecessary surgery by nearly one-third in this specific patient population, but also can support more targeted, personalized approaches to patient care," said the paper&apos;s senior author, Constance Lehman, M.D., Ph.D., professor at Harvard Medical School and Director of Breast Imaging at MGH. "Our goal is to apply the tool in clinical settings to help make more informed decisions as to which patients will be surveilled and which will go on to surgery," Dr. Bahl added. "I believe we can capitalize on machine learning to inform clinical decision making and ultimately improve patient care."